Critical study on the life and works of PJF, with essays about the Riverworld, World of Tiers, Night of Light, Venus on the Half-Shell and more. With a selected bibliography, which lists As You Desire as a published book. It's not! Subtitle: Writings on Philip José Farmer 1996-2018. A collection with a selection of Carey's essay and interviews with him. Illustrated with photos and many book covers. - "Farmer's Escape from Loki: A Closer Look"
- "The Green Eyes Have It—Or Are They Blue?" - "A Meteor Over Pangea"
- "The Innocent Dilemma: Reflections on The Unnaturals"
- "On Hadon of Ancient Opar"
- "Through the Seventh Gate: Pursuing Farmer's Sources in Savageology"
- "The Grand Master of Peoria"
- "Philip José Farmer on the Road to the Emerald City"
- "The Archaeology of Khokarsa: Sources in Farmer's Ancient Oparian Motherland"
- "The Magic Filing Cabinet and The Missing Page"
- "How Much Free Will Does a Pumpkin Have?" - "More Real Than Life Itself: Philip José Farmer's Fictional-Author Period"
- "In the Alien Corn: Philip José Farmer and The Other"
- "Philip José Farmer and the Cross-time Continuum"
- "Philip José Farmer: A Remembrance"
- "Philip José Farmer and Edgar Rice Burroughs: A Shared Mythography"
- "Gribardsun and the Prehistoric Wold Newton Family"
- "Collaborating with a Grand Master"
- "The Literary Archaeology of Khokarsa"
- "An Archaeology of Dreams"
- "On Restoring Farmer's Flight to Opar"
- "A History of The Song of Kwasin"
- "Postscript—Philip José Farmer: The Next Hundred Years"
Critical and comprehensive look at Farmer's major themes and fiction. With a selected bibliography. "...Generally, Chapman has done an admirable job...", Gary K. Wolfe in his review of this book in Science Fiction Studies #37, Volume 12 Part 3, November 1985. A beautiful book with 128 full color illustrations of most USA hardcover and first paperback editions, plus some British editions. With a foreword by Farmer. Program booklet for the convention of July 30-31, 2006 in Peoria, Illinois. It was held at the house of the Farmers, on invitation only. Program booklet for the convention of August 4-5, 2007 in Peoria, Illinois. It was held at the house of the Farmers, on invitation only. Program booklet for the convention of July 26, 2008 in Peoria, Illinois. It was called FarmerCon 90 because of Farmer's 90th birthday earlier that year. - What Exactly is a "Farmercon" Anyway? Program booklet for the convention of June 6-7, 2009 in Peoria, Illinois. This was "The Philip José Farmer Memorial Gathering", because of Phil's death on February 25th, 2009. Program booklet for the convention of June 25-27, 2010 in Seattle, Washington. Held in conjunction with the Locus Awards Weekend and the Hall of Fame Induction at the SF Museum. 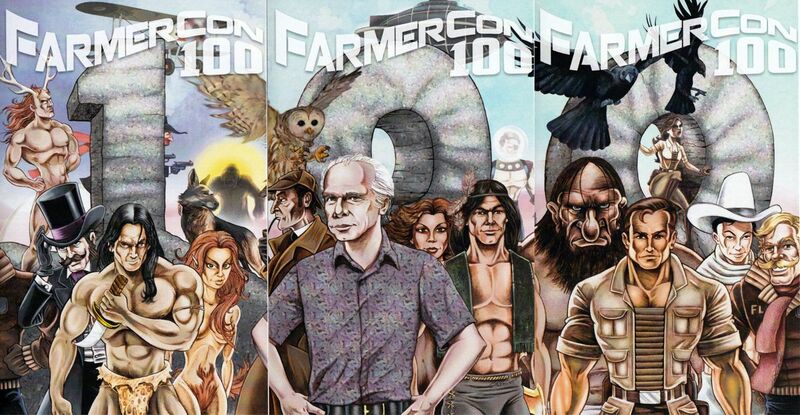 This year not a FarmerCon program booklet, but a special supplement in the magazine that was published for PulpFest 2011. FarmerCon was taking place at PulpFest, July 29-31, 2011 in Columbus, Ohio. - "Kwasin and the Bear God"
Program booklet for the convention of August 9-12, 2012 in Columbus, Ohio. Held in conjunction with PulpFest 2012. Program booklet for the convention of July 25-28, 2013 in Columbus, Ohio. Held in conjunction with PulpFest 2013. Program booklet for the convention of August 7-10, 2014 in Columbus, Ohio. Held in conjunction with PulpFest 2014. - "Announcing The Monster on Hold by PJF and Win Scott Eckert"
Program booklet for the convention that was held from August 13-16, 2015 in Columbus, Ohio. Held in conjunction with PulpFest 2015. Program booklet for the convention that was held from July 21-24, 2016 in Columbus, Ohio. Held in conjunction with PulpFest 2016. Program booklet for the convention that was held from July 27-30, 2017 in Pittsburgh, PA. Held in conjunction with PulpFest 2017. Three program booklets for the 13th FarmerCon that was held on July 26-29, 2018 in Pittsburgh, PA. Held in conjunction with PulpFest 2018. The program book was divided in three pamphlets, each one with a part of the continuous cover illustration done by Keith Howell. See here the complete cover. This reception was held on May 19, 2001 in honor of Philip José Farmer receiving the 2001 Grand Master Award. This booklet is a report of the event, with many photos. It also contains the announcement of the SFWA president, that PJF is the Grand Master for 2001, and a photo of the award. A nice chapbook published on the occasion of the 50th Anniversary Celebration of "The Lovers" on August 10, 2002 in Peoria. It was given for free to the people attending the celebration. It contains original art, reprinted letters about "The Lovers" from the magazines short after its first publication in 1952, a portrait of Phil by Harlan Ellison, many letters from other science fiction authors congratulating Phil with this anniversary, and the text of the plaque that Farmer received during the celebration from the International Philip José Farmer Fan Club. Bibliography. Very useful at the time of publication, although is misses several (non-fiction) items. It lists As You Desire as a published book, it's not! A privately published and very limited edition. Comprehensive bibliography, it lists all known editions and translations, short fiction, non fiction and covers much else by and about Farmer. It was the start for this website eventually. Subtitle: Writings Inspired By The Father Of The Wold Newton Mythos. A collection of Wold Newton Universe essays, with which Small celebrates the 100th Anniversary of the birth of Philip José Farmer. - "Kiss of the Vampire"
- "The Eugenics War: Declassified"
- "A Case of a Case of Secret Identity Recased"
- "The Bat, the Hornet and the Shadow"
- "The Super Friends-Scooby Doo Counter-Revolution Polka"
- "The Bright Heart of Eternity"
A very comprehensive bibliography. It covers in eighteen sections all the works by and about Farmer through 1990. One of the best bibliographies of Farmer's work on paper.